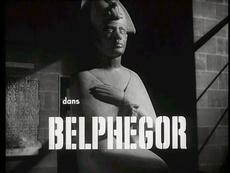 Photo gallery from the series Belphégor, Claude Barma, 1965. Except for the first chapter (selection by Génération Séries), These pictures are here in chronological order. Althought I kept the captions as limited as possible, the gallery contains spoilers because the pictures graphically reveal key elements of the plot. However, they do not contain the leading key which is: Who is Belphégor? File created 01/12/2002 AD 18:19:22 with software Albagtor version 7.22, last update 11/04/2007�AD 22:20:07 by Baptiste Marcel (baptiste@dunwich.org), located in Asnières-sur-Seine. If you enjoyed this page, please feel free to visit my homepage and to request more information about this site.